2016 Emergency Services Day, Newark. I saw this Ausin Loadstar and being involved with the restoration of horse drawn carriages it was taken aback by the sheer size of these escape wheels. They would cost a huge sum to be made today and thats only if a wheelwright could be found with the knowledge to make a pair. Bayley also made London Trolleys for the greengrocery trade and these were bulky and cumbersome just like their escape wheels. That said, i would have this in my collection if space allowed. What a fabulous beast. I assume this very rare Austin Loadstar PE had a hose reel system because the JCDD spec sheet required one. But its difficult to see where the reels were installed, as in those days placing them behind locker covers was not the usual way of doing things. Its also a bit of a puzzle where the suction hoses were hidden, too! Added by Rob Johnson on 24 April 2018. They must be there somewhere. If you zoom in on the pump bay of photo #54089 it shows a tap marked "Tank/ H. Reels", a lever marked "Primer Clutch" and a compound pressure gauge. Added by Alan Woodward on 16 January 2019. Hose reel is behind rear most locker cover and suction is in bodywork top right , I think ! Added by on 18 January 2019. On closer inspection, it does look as if there is a single transversely-mounted hose reel in a recessed box in the rear, although accessing this - not to mention rewinding it - looks like quite a challenge! If indeed it had suctions, I can only imagine they were stored under this reel, and also unloaded from the rear like the contemporary Merryweathers. This would presumably involve slipping the escape, which was presumably also a good idea if the crew wanted to use the hose reel too! Added by Rob Johnson on 18 January 2019. Hose reels are in the larger rear locker above the rear wheels. Added by Michael G on 19 January 2019. Suction is laid under the curved bodywork top right. Added by CraigW on 23 January 2019. Rob there are two hose reels they are fitted either side of the vehicle in the largest rear lockers. It's not a single transverse reel. 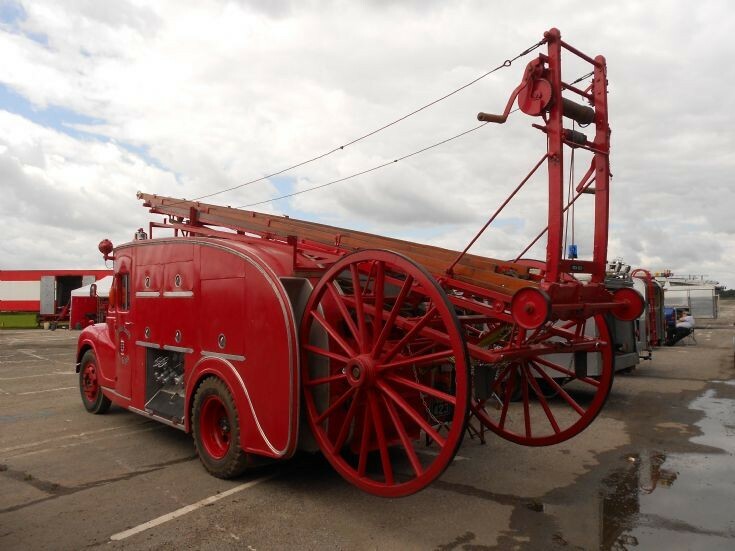 If you use a search engine to find Austin Loadstar fire engines there are some good pictures (by Kevin Hale) one showing the hose reel in use. Added by Michael G on 26 January 2019.